. : L I V E : L O V E : L E A R N : E V O L V E : S U S T A I N : I N T E G R A T E : U N I T E : . 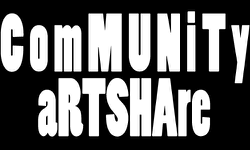 Community Art Share is a non-profit organization that both supports and is supported by artists. Our mission: Strengthen community and provide opportunities for artist sustainability. It is about bringing people together, sharing and celebrating our differences, and thriving while we do it. We are creating ways for people to start shifting out of an old world and in to a new one. Community Art Share promotes anything and everything having to do with positive progress, creativity, movement and the evolution to a Sustainable Eco-centric World. Community Art Share produces and promotes conscious gatherings which include a wide variety of activities, performances and installations. Anything creative, artistic, intelligent, intentional, positive, expansive, evolutionary, sustainable and fun should be promoted and shared with our community. It is our intention to bring a shift in awareness back to ourSelves and our aspirations; our goals, values and intentions in life; our creativity. We embody positivity, health and well-being. Our aim is bringing people together in a collaborative effort to increase sustainable and beneficial practices while celebrating and sharing our creative endeavors.
. : : ThaNK yOu FoR SuPPoRTiNg CReATiViTY & ComMUNiTy : : . . . . . . . . . . . : : CMUNTRTSHA : : . . . . . . . . . . . . : : LoVe aND BLesSiNGs FroM ComMUNiTy aRT SHAre : : .